There is nothing I love more than a comfortable dress to wear on a hot day! Perhaps that is why this dress has been hanging around in my closet for three years now. That's a long time for anything to stay in my closet, for I usually tire of clothing after one or two wears, and sell it to buy something new! But this dress is one of my favs! It is made by Joe Fresh, and it is a soft jersey knit. I usually wear a tank underneath because it can expose too much cleavage for my comfort level. The last time I wore it was on the 4th of July, and I wore a tee shirt under it and red Keds. You can see that look HERE. For today's look, it was hot, so I wore it plain and simple with just a tank underneath. I did bring a white jean jacket with me in case it got too cold inside buildings, but I never ended up needing it. I picked this jacket up at Kohls a season or two ago. The dress has a more athletic style back, which adds some uniqueness to an otherwise simple dress. I paired my dress with white sandals (old), a white shell necklace (old) and a white beaded bracelet (old). 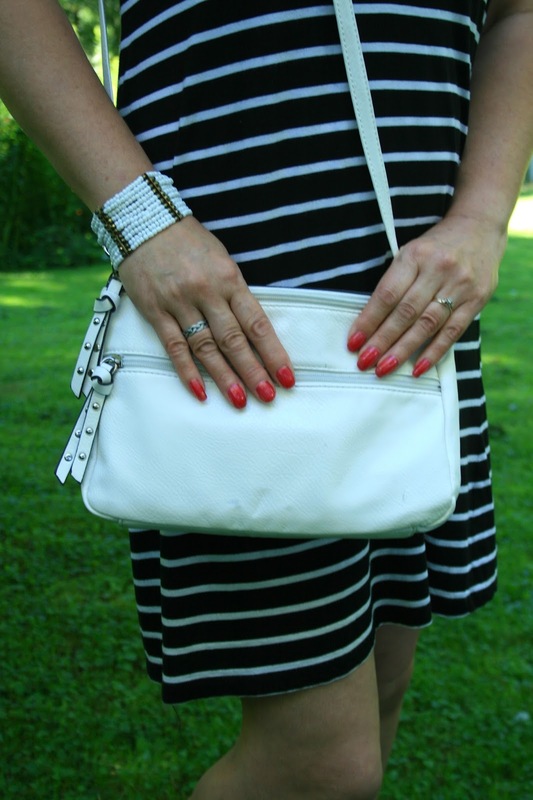 The only thing new this season would be my cross body white hand bag from Wilson's Leather. Would you believe I lost this necklace shortly after taking these photographs? So bummed. It fell off my neck somewhere in my yard. We walked the entire yard looking for it (and it's a huge yard!) and couldn't find it. Hopefully it'll turn up when I'm working in the garden someday. I know I've shown you these shoes a thousand times before, but I'm always getting new visitors who may have never seen them. They are just so comfy, and because they are white, they go with everything…so I wear them….a lot! That's a good thing, right? 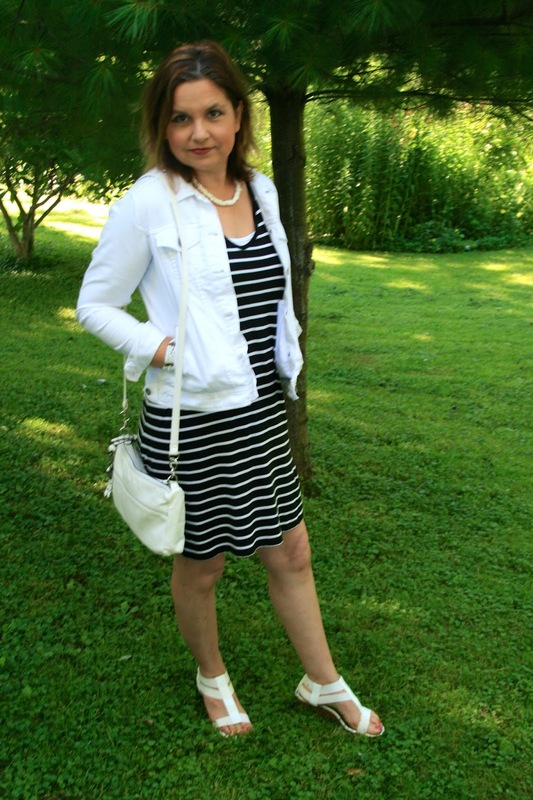 I love comfy dresses for the summer and stripes are always a great choice! You can never go wrong with classic b+w stripes especially in a dress form. Love your white denim jacket and your nails look great! 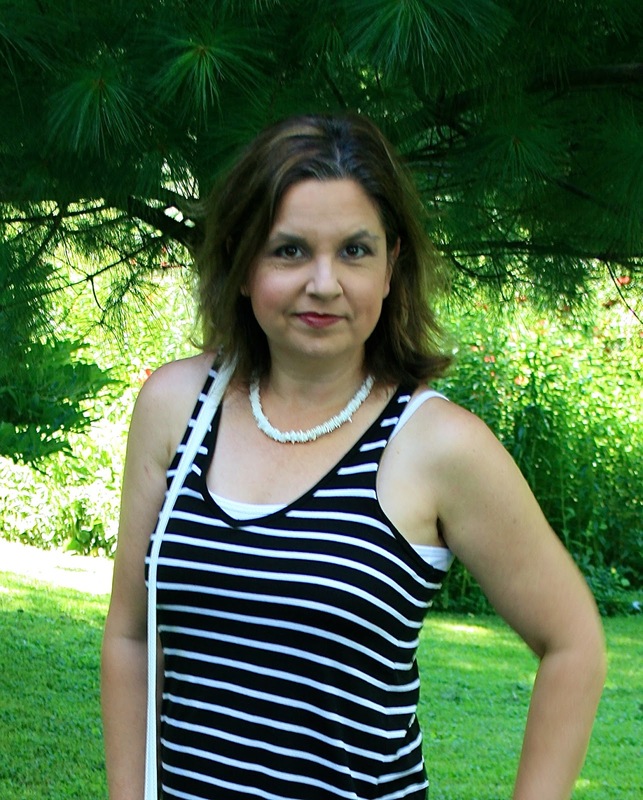 You look fabulous and you can never go wrong with stripes! Love those wedges too! It's a very easy, on the go summer look. I love striped dresses. I have a comfy dress on right now and I pull it out all the time when it is hot and humid here. Such a great dress, you can't go wrong with stripes! Great dress! everyone needs some stripes in their wardrobe! This dress looks so comfortable and cool! so on trend with the stripes! This is such a cute, classic summer dress. I've been on the hunt for a striped dress for a while now, it's such a classic piece. Striped dresses are the best! They are so versatile! I love how you styled yours! You can never go wrong with stripes! Thanks for linking up today! Looking lovely in stripes, I need to add some to my wardrobe. Pretty white sandals as well. You are right, such a dress is a perfect choice to wear on a hot day! I have kind of similar one in my wardrobe, too. 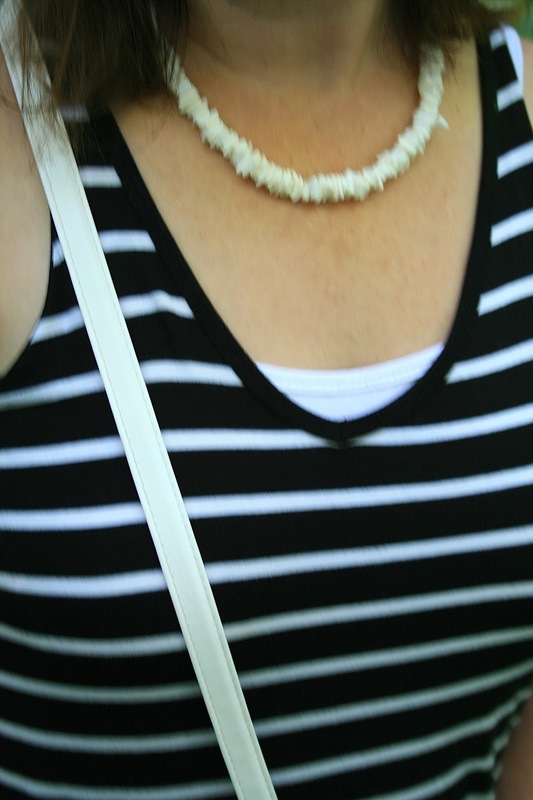 And can you believe it, I have exactly same shell necklace! Hope, you will find yours after all! Very pretty and simple! Love it!